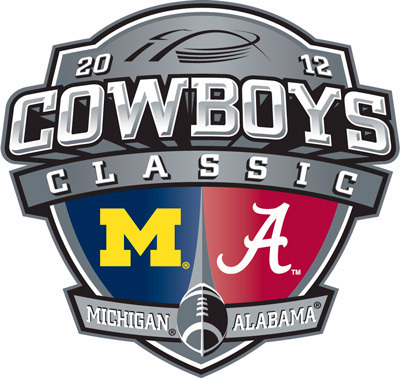 The magic number for Michigan to beat Alabama is 24 (The Wolverine $). SI's breakdown of Alabama is a good primer for Joe 6-pack (Michigan's too). MGoBlog Preview. BWS Preview. Holdin' the Rope Preview. MaizeNBrew Preview. Big House Blog Preview. MGoBlog FFFF. Tremendous One Key. MZone Know Your Foe. MVictors This week in Michigan football history. Spread, Pro-Style, or Hybrid? Pro-style. Alabama mostly operates from under center, usually with either a fullback/H-back or second tight end on the field. Basketball on Grass or MANBALL? Though the Crimson Tide offense operates in the spirit of MANBALL, they actually utilize a lot of zone blocking—the inside and outside zones are staples of their offense. Base Set? 3-4, though they'll often have a fourth defender with his hand down; this is a defense that isn't afraid to show several different looks over the course of a game. Man or zone coverage? Zone. Saban's favorite coverage is the Cover 1 Robber. Normally the Cover 1 is a man-to-man defense with one deep safety; Alabama adds an underneath zone—the "robber"—and has their defensive backs play "pattern reading" zones—think of it as a matchup zone in basketball, with DBs reading the route patterns on the fly and sticking close to receivers who come through their area instead of dropping to a particular spot. They'll also mix in Cover 2, Cover 3, and a little man-to-man. Alabama gets a ton of credit for their dominating defense. While, yes, I do agree that they were amazing last year, they only return 4 starters. The big question mark is can this talented, but inexperienced as a group – gel fast enough to stop one of the most prolific play makers in college football? Let's get straight to the point. I don't think Fitz plays in this game. Hoke has been keeping his decision to himself throughout fall camp, which has been driving everyone crazy. You could call that gamesmanship, call it whatever you want, I still don't think he plays. We'll find out at 7PM central time on Saturday. Do I think he should? No. He made a very bad decision and he need to be held accountable. I think Hoke is doing just that. It's the right call, even though it will negatively impact Michigan's offense, it's the right call. So that leaves guys like Thomas Rawls, Vincent Smith, Stephen Hopkins and Justice Hayes to lead the rushing attack. Obviously there's some competent backs there, but no one who has shown they can carry the load like Fitz can. This will be a big challenge for Michigan. I suspect as well that Denard will be asked to do more with his legs without #28 lining up behind or next to him. Alabama loses a lot of big time talent up front going into this season. Gone are DT Josh Chapman, a trio of All-American LBs – Dont'a Hightower, Jarrell Harris and Courtney Upshaw. 5-star recruit Trey DePriest will replace Hightower as the signal-caller at MLB. Also at LB will be junior CJ Mosley who was a standout last year in their nickel package. I do think if you're going to play Alabama, you want to play them early. Yes, Alabama has reloaded with simply great talent at almost every vacancy, but they are inexperienced as a group. This can only be seen as a potential advantage for a Michigan offense that returns the bulk of the yardage output from last year and 5 experienced guys along the O line. Speaking of the line. Keep an eye on center Ricky Barnum. The converted guard has some big shoes to fill, but from what we're hearing, he's done well so far. This is the first time he's ever played center in his career. Guards Patrick Omameh and Elliot Mealer should do fine, as should tackles Taylor Lewan and Michael Schofield. For all of the credit Alabama's O-Line gets, Michigan's ain't no slouch – well, the starting line anyway. An area of concern for Michigan as well as Alabama is the Michigan passing game. Denard has had less-than-great moments throwing the ball, which can drive Michigan fans crazy, but he's still a senior QB with a ton of big game exposure. Plus his ability to turn nothing into 6 points is something not many teams, Alabama included, have ever really seen before. Lack of experience abounds on both sides of the ball, however. Michigan needs Roy Roundtree, Jeremy Gallon and TE Brandon Moore to step up big time. I think Jeremy Jackson could make a splash in 2012, hopefully starting with this game. Drew Dileo can be valuable in games like this as well simply because he's fast and has good hands. For Alabama, they lose a ton of talent in the defensive backfield. Both cornerbacks, All-American Dre Kirkpatrick and DeQuan Menzie are gone. All-American FS Mark Barron is gone as well. Senior SS Robert Lester has shifted over to FS for 2012. Expect Borges to test the new guys early and often. Welp, this is where things get tougher. We've heard so much about Alabama's offensive line. Yes, they're good, they're big and they're experienced. Michigan will not face a tougher group the rest of the season. Mattison has stacked as much beef as he can up front as he can to take them on. From strong to weakside...Craig Roh, Quinton Washington, Will Campbell and Jibreel Black...with Washington playing the nose. That front 4 leads me to think some new wrinkles and schemes could be in store for the other 7 defenders on the field. But Alabama is all about ground-and-pound. They want to beat you into submission with the ground game, because they can. My only hope is that we can keep some sort of regular rotation of players throughout the game. That, and hopefully the offense can spare the defense a with some long drives. Alabama will miss Trent Richardson, but guys like Eddie Lacy and Jalston Fowler will look to pick up where Richardson left off. Lacy was a very good alternative to Richardson last year. He can move. AJ McCarron isn't the greatest QB in the world, but his arm is good and he can run the offense the way it needs to be run. Alabama is a run-first offense...no question about it. If there's a bright spot for Michigan, it's that Alabama's receivers are about as big of a question mark as Michigan's. 2012's 4 leading receivers, including Marquise Maze and TE Brad Smelley are gone. From what I've read, none of the top guys coming back were really able to separate themselves in spring camp, so the start of 2012 will be an audition of sorts for guys like Kenny Bell, Christion Jones, DeAndrew White and Kevin Norwood. Watch out for Michael Williams at tight end though. For Alabama, Jeremy Shelley is the returning place kicker. He knocked in 21 of 27 kicks last year, and 52 of 54 PATs. McCarron is the holder, btw. Cody Mandell is the returning starter at punter. He averaged 39.3 yards per punt last year. Marquis Maze was the key return man for Bama last year, but he's gone. Taking his place on punt returns is Christion Jones and Dee Hart, and on kick returns is Jones and Dee Millner. Will Hagerup or Matt Wile will start at punter for Michigan, the only 'or' on Michigan's depth chart. Wile will handle kickoffs. Brendan Gibbons returns to handle placing-kicking duties after cementing his place in Michigan lore in the Sugar Bowl in January. Kick returns will be handled by Josh Furman(!) and true-freshman Dennis Norfleet (!!). Norfleet will back up Jeremy Gallon on punt return duties. Those exclamation points are there to express excitement, not concern. • Denard is completing passes to guys wearing the same color jersey as him. • 3rd down isn't an obvious passing down. • You know the name of Alabama's punter by halftime. • Brent Musburger says 'Denard' and 'Heisman' in the same sentence more than once. • Eddie Lacy reminds you of Trent Richardson. • Alabama's receivers are doing their best DeVier Posey impression on our DBs. • You can't remember the last time Michigan had the ball. • Kirk Herbstreit can't stop giggling.